Marume Natural Brown Filters are a must have addition to supplement your cost saving solutions for the Keurig brewing system. If you are purchasing the Keurig reusable K cup or related Keurig K cup Accessories, our K cup filters will be a necessary addition to keeping your coffee free of sediment, low cost, and made from personal selection of coffee. 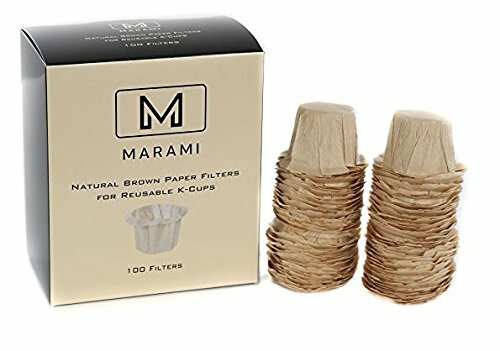 Marume filters are made from blends of organic and natural wood pulps to create first class Keurig coffee filter paper for reusable K cup filters and reusable K cup pods. Marume introduced its paper coffee filters for Keurig because we wanted a more health conscious and environmentally safer product that reduced the use of plastic in our environment. Our K cup filters are sustainably made with a commitment to minimizing plastic packaging with an emphasis on biodegradable packaging. Your coffee pot should only contain the coffee tea you want in it, whether it is sourced from your local brewery or an organic farm. Whether you enjoy Arabic coffee, Turkish coffee, Kenya coffee, or Petes coffee. Heck even if you enjoy blueberry kcup german chocolate cake kcup, french toast kcup, mr coffee kcup, chocolate glazed donut kcup, island coconut kcup, cafe mocha kcup, irish cream kcup, english toffee kcup, pumpkin spice kcup, or english breakfast tea kcup, our filters give you the freedom to pick any variety of coffee, tea, or flavored beverages you like. 【Compatibility】 Natural brown filters designed for the single serve My K-Cup®, EZ-Cup®, Solofill®, EkoBrew®, Simple Cups® (Not compatible with the K-Carafe®). Our filters measure 1' 7/8" inches in height. 【Advantages】 Marume filters keep gritty coffee sand from getting into your morning cup of coffee with optimal paper tensile strength and guaranteed no-rip filters. We promise your satisfaction or your money back. 【Savings】 Save over 80% of your hard earned money, take back control of your coffee, and be independent from single use K-cups. 【Benefits】Our filters are 100% chlorine free and minimally processed. Marume is a worker run company that respects your health and takes sustainable environmental practices seriously. 【Eco Friendly】Unlike our competition, Marume is committed to keeping plastic out of our environment and out of the food chain. We minimize the materials in our packaging to reduce our carbon footprint and save you money at the same time. If you have any questions about this product by Marume, contact us by completing and submitting the form below. If you are looking for a specif part number, please include it with your message.